Notes: This is a manual focus only lens. It is compatible with full frame and crop frame sensors. 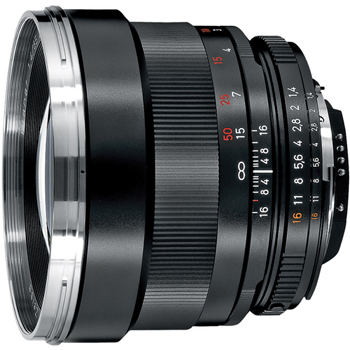 The Zeiss 85mm f/1.4 ZF.2 Planar T* for Nikon is compatible with both full frame and crop frame sensor Nikon cameras. There is no AF on this lens so it is suitable for videography or any other work that can't have lens motor sounds. It is set at a classic portrait length and performs best in environments that allow you to have some distance from your subject. It has a distortion-free performance at all apertures and also produces pleasing out-of-focus backgrounds. Selectively focusing on this lens is smooth and accurate thanks to a floating element system inside an all-metal design. This lens is ideal for studio work, still life, portraits, and fine art photography.